The days are steadily growing cooler, and the nights even colder. The flannel sheets and down comforters have made their way on to the kids beds, and the wood stove has already had a few fires. Every wind storm we have, more and more leaves are blowing to the ground. Northern Maine has already had snow. The change of seasons is fully upon us. I love watching the little changes the world around us makes. When the days and nights get colder, I notice the birds are nearly emptying the bird feeders on a daily basis. The small and large animals are on the constant move, gathering up food and trying to stay warm before they make the final descent into their winter slumber. The leaves change color and float or blow to the ground creating the best fall photos and leaf piles. The vegetable and flower gardens are put to bed until next year to keep the sleeping bulbs and perennials safe and warm. And of course, the subtle shift in the available foods in the store. Those little round, red gems are starting to show up again, and I am pretty excited. I’m talking about cranberries! Over the past years, I have discovered that I actually love those tart little berries. They add a great oomph to certain desserts. When I went grocery shopping a week or two ago, I saw a bag of fresh cranberries sitting next to the strawberries. I grabbed them, not yet knowing exactly what I wanted to use them for. So, later that week, when I saw the two bags of apples that were still waiting to to be used or processed, I thought, “Aha! 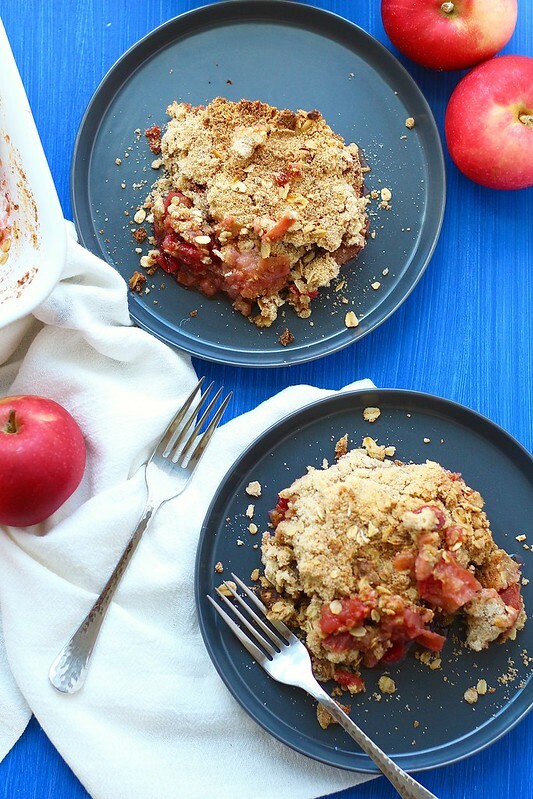 Apple cranberry crisp would be perfect!”. And boy, was it ever. I decided to base the recipe off of one of my favorite apple crisp recipes, with a few minor tweaks. It worked out beautifully. 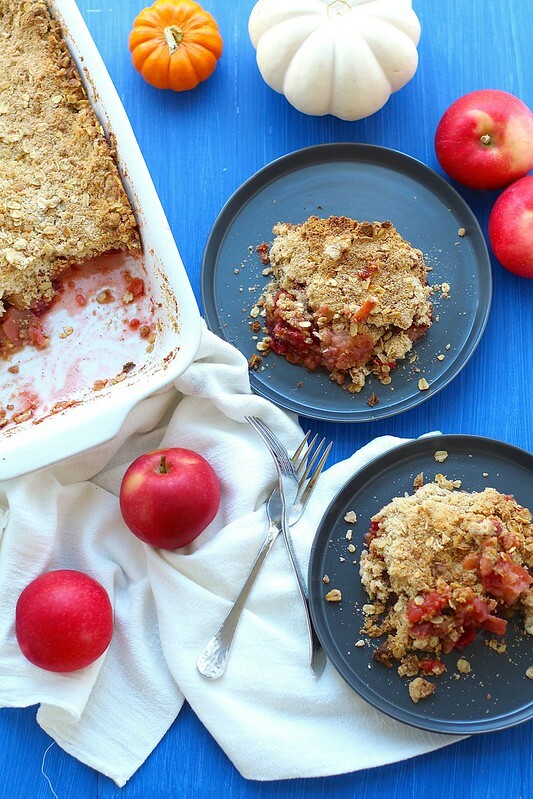 Naturally, cranberries and apples are an excellent combination, so this was bound to be a winner. I minimally reduced the sugar in the filling so the cranberries would shine, but not be overly tart. 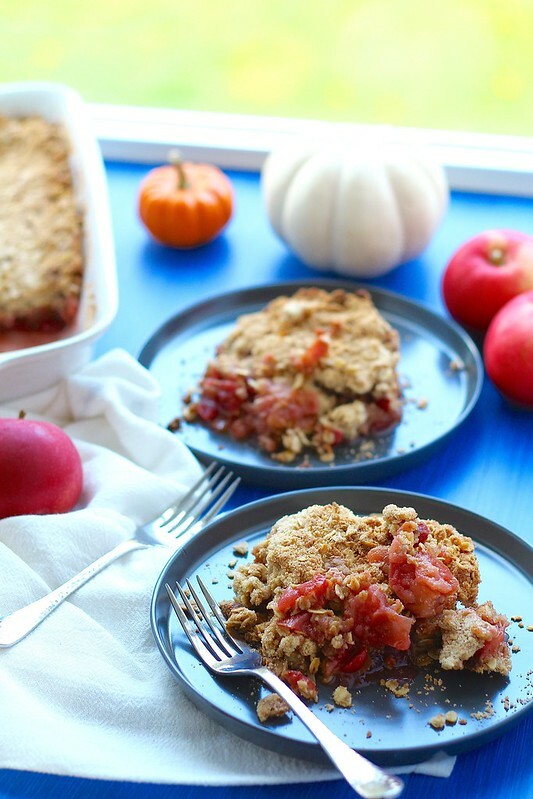 The spices and combination of apples and cranberries makes this the ideal fall treat. I served the crisp with some vanilla ice cream and I saw a lot of happy faces. To make the topping, in a large bowl, whisk together all the ingredients except the butter. Then, toss the butter pieces in to coat with flour. Rub the butter in with your fingertips until incorporated, but some larger pieces still remain. Place in the refrigerator while you make the filling. Preheat the oven to 400ºF. Grease a 9x13 inch baking dish. Set aside. 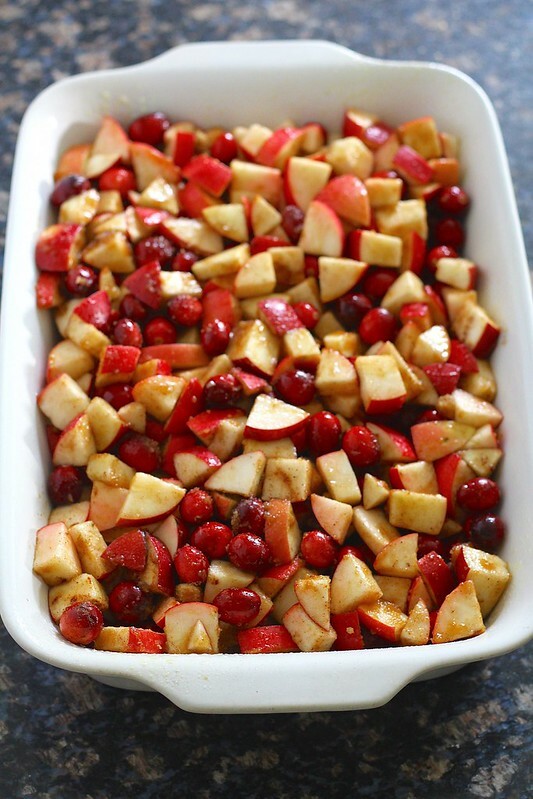 To make the filling, mix together all the ingredients until all the apples and cranberries are coated. Pour into the prepared baking dish, leveling with the back of a spoon. Sprinkle the chilled topping evenly over the filling, making sure to cover completely. Place in the preheated oven and bake for 40-45 minutes, or until the filling is bubbly and the topping is golden brown. Let cool slightly before serving. Scoop into shallow bowls and serve with vanilla ice cream, if desired. Refrigerate any leftovers, well covered, up to a week, warming before serving.